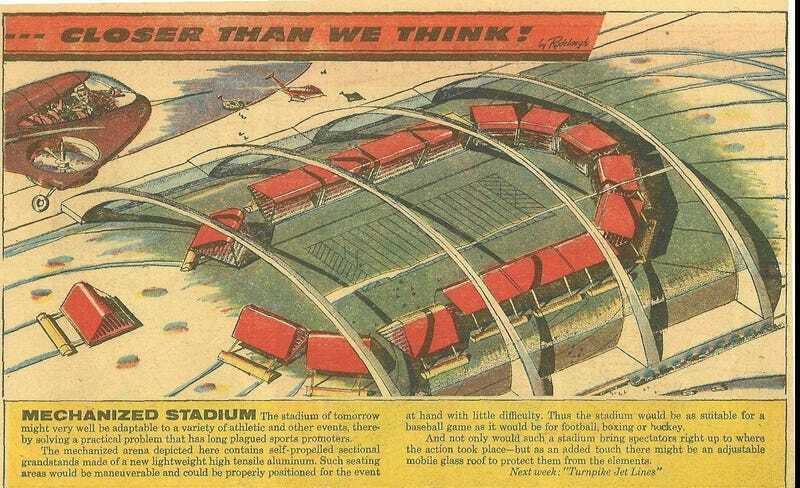 The November 2, 1958 edition of Closer Than We Think featured a "mechanized stadium." The stadium of tomorrow might very well be adaptable to a variety of athletic and other events, thereby solving a practical problem that has long plagued sports promoters. The mechanized arena depicted here contains self-propelled sectional grandstands made of a new lightweight high tensile aluminum. Such seating areas would be maneuverable and could be properly positioned for the event at hand with little difficulty. Thus the stadium would be as suitable for a baseball game as it would be for football, boxing or hockey. And not only would such a stadium bring spectators right up to where the action took place - but as an added touch there might be an adjustable mobile glass roof to protect them from the elements. Next week: "Turnpike Jet Lines"
Many thanks to Tom Zmudzinski for providing this difficult to find strip.